� 29.01.2011 - Mubarak plays the "looting card"
� 10.03.2010 - "Egypt uses torture in terror fight"
afrol News, 16 February - Several important relics from the Egyptian Museum in Cairo are reported missing after the unrests, including a statue of Tutankhamen, the UN today confirms. 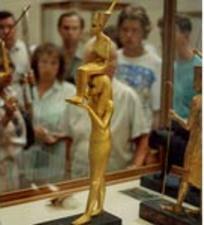 The famous statue the goddess Menkaret carrying King Tutankhamun on her shoulders may have been seriously damaged. Fragments belonging to the statue have been found at the Cairo museum, but the small figure of the king has not yet been found. "Egyptian authorities have reported that several important pieces have been stolen from the national museum, including the wood statue of King Tutankhamen being carried by a goddess," Director-General Irina Bokova of the UN's cultural agency UNESCO confirmed today. During the Egyptian riots, focused on central Cairo's Tahrir Square where also the Egyptian Museum is located, several ancient artefacts were stolen. Also at historic and archaeological sites, which were evacuated during the protests, important artefacts have gone missing, it now turns out. So far, Egyptian authorities have mapped 17 historic pieces missing from the Egyptian Museum and from the museum warehouses. Authorities expect more artefacts will have to be added to the list of missing items. UNESCO's Ms Bokova now called on states, all public and private art dealers and collectors across the world to be on the alert. "It is particularly important to verify the origin of cultural property that might be imported, exported and/or offered for sale, especially on the internet," she said in a statement. "This heritage is part of humanity's history and Egypt's identity. It must not be allowed to vanish into unscrupulous hands, or run the risk of being damaged or even destroyed," she appealed. "Trading or buying cultural property is an international crime that is punishable by law," Ms Bokova added. "Every possible measure must also be taken to provide the security necessary to protect Egypt's heritage sites and prevent any further thefts," the UNESCO leader further urged.